I'd thought I was done with Superman until DC Rebirth. Then the news came out that they would be planting the seeds for what was to come in the last few Superman comics. What sold me on giving this issue a shot, however, was the fact that it was by Peter Tomasi and Mikel Janin - two creators whose work I've generally enjoyed when I encountered it. And I was not disappointed. As a result of the last Super-Crossover (which inspired me to drop this title originally), Superman has regained his powers. Unfortunately, he's also contracted some form of Kryptonite cancer. He may have become a star again but one that is doomed to burn out soon. 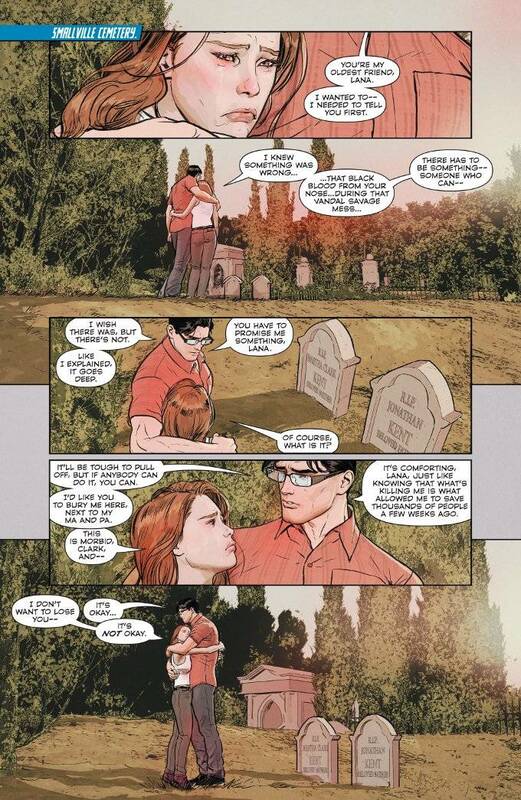 With death a certainty, Clark Kent begins making arrangements for his death. Some may say this is derivative of Grant Morrison's All Star Superman, but Tomasi's script finds a humanity in Superman that Morrison's story lacked. The focus here is not on the wonders Superman tries to fashion in the brief time left to him but how Clark Kent makes peace with his loved ones. That humanity is something that has been sorely lacking in the Superman stories of late and it makes this issue all the more powerful. That power is equaled by Mikel Janin's artwork. There is a unique clarity and brightness to Janin's colors and character designs that makes every page of this book a delight to look at. Janin is also a great visual storyteller, and the action of the issue flows easily from panel to panel.